At Cooking A-Z by Tumacookery you’ll learn skills and techniques as well as share the experience of cooking with others who have a passion for preparing delicious food. We'll show you how to create dishes from Balinese to Southwest Cuisine, Italian to German, hors d’oeuvres to desserts A-Z. Your class will be held in our new teaching kitchen equipped with high quality tools, cooking surfaces, and cookware. 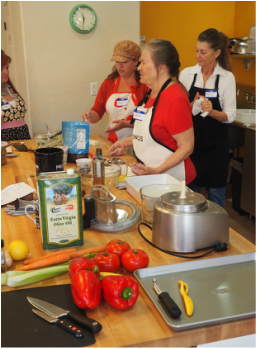 Classes are open to any level of skill from beginners to experts, with basics through advanced cooking techniques. Much of the equipment used in your class session is available through our Tumacookery store. Learn the fundamental skills for great cooking. - Work side-by-side with other students to prepare a variety of dishes. - Interact with classmates and the instructor for a rich learning experience. - Take home class recipes. Our staff includes guest chefs drawn from local talent and restaurants, cookbook authors and cooking professionals who will demonstrate and share their talents with you. Click on Class Description to see what our Chefs are offering this month!